Last week, under a non-disclosure agreement, Blizzard was briefing the press and major fansites on Mists of Pandaria, particularly teasing the new features and systems. Now that the NDA is over, that information has hit the internet in a big way. As usual, places like WoW Insider, MMO-Champion and Wowhead News have got mountains of information in one place, so those should be your main reference. Obviously the blogosphere has been analysing this as well and rather than linking to every post, I’ll just refer you to MMO Melting Pot who have posted a couple of excellent round-ups with enough links to keep you going until the beta arrives. 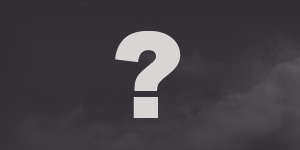 Here are the things that jumped out at me most, and the reasons I’m looking forward to Mists. There wasn’t a lot of focus on classes specifically at the press event, but they have recently been drip-feeding information in the form of talent “trees” and a recent update on the Priest class design. A perfectly reasonable position; Discipline rarely uses Renew and neither spec uses Holy Nova much. As much as we like to talk about picking the right tool for the job, when one tool can do every job pretty well the others will tend to get left in the metaphorical shed to go rusty. In theory we can use Holy Nova while running as a group, but in practice it’s usually easier to just run first and then throw out an extra Prayer of Healing instead, and even heroic encounters generally aren’t tuned quite tightly enough that you need to heal that quickly to save a wipe. Prayer of Healing can be used by Holy and Discipline once again. We realized that the goal of making Holy Nova an effective AE healing tool was problematic. It meant that we would have to change Holy Nova so thoroughly, that it was becoming a second Prayer of Healing. In the current spell design paradigm, instant-cast AoE tends to come with a cooldown or high mana cost as a penalty (see: Wild Growth and Circle of Healing or Healing Rain), and it also has to be flexible enough to be a staple AoE heal for Disc Priests instead of a situational ability (caster-centred counts as situational because it requires control over positioning and its value varies strongly from fight to fight). Put those constraints together and you’re left with either a Circle of Healing lookalike (instant but with a cooldown) or, well, Prayer of Healing. One alternative would be for Disc to only have a situational AoE heal; for a discussion of why that wouldn’t fit too well into the current game, see Holy Paladins in WotLK. I applaud the aim of the developers to further distinguish Holy and Discipline. I love that each spec gets its own way of going about things and attacks the healing problem from a different direction, and on the whole I’m encouraged by what I’m hearing. I like the sound of Discipline swapping Heal for Spirit Shell (a single-target, medium cast-time, fairly small bubble; what I’ve taken so far is that Spirit Shell is to Power Word: Shield what Heal is to Flash Heal) and I’m looking forward to playing the beta and getting my hands on the talents and new abilities and seeing what I really make of them in practice, rather than just speculating based on tooltips. The big news, which isn’t really news but is worth bringing up again, is the removal of the Prime glyph slot. Basically the job done by Prime glyphs is now done by talents instead. Apparently Blizzard intend to expand the range of cosmetic effects offered by the Minor glyphs to compensate. 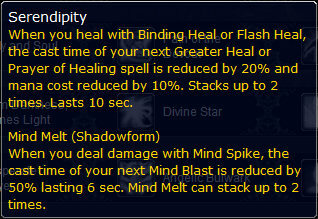 In Mists, both glyphs and talents are changeable using a new reagent, the Tome of the Clear Mind. If you want to change a talent, you consume one reagent to ‘forget’ one row of the talent tree and you can make that selection again; you clear talents one row at a time, you don’t have to respec entirely just to swap one level of talents. Only dungeons since there wasn’t much about raids, except to tell us who the end boss of the final raid will be. I won’t spoil it, for the handful of people who haven’t already been spoiled. They did also say that Tier 14 will feature 14 bosses split into three instances, which is a pretty good way to start the expansion. I’m actually OK with funnelling players down into one final raid at the end of the expansion, but at the start it’s important to have a good range of equivalent difficulty places to see, especially when you’re gearing up your raid team and you can’t assume a certain gear level like you can in later tiers. Getting stuck on an early gearcheck boss would be a real turn-off, but this way you can swap around and try each of the entry-level bosses and get some gear into the raid. On the subject of gearing up, they’re talking about a revamp of Valor Points as well. Again, according to Wowhead News, the idea at the moment is to use them like the Crystallised Firestones from Firelands as a way to upgrade the item level of gear. Presumably, instead of saving up 2200 VP for some new legs, you just upgrade your old legs to the current item level. It’s not clear if you can get more than one tier of upgrade out of an item, or if any item will be upgradeable or if there will be limitations by slot (in the same way VP gear has not covered every slot thus far); either way, if the drop rates are kept similar to the current rate, gearing up this way will take a while so you’ll still want drops rather than just getting BiS T14 and waiting to upgrade it. It’s an interesting change, although I don’t know if it’s as big a gain as it sounds. Under the Cataclysm system you might be looking at a new VP item with an inferior stat mix and that obviously won’t be the case under the Mists system, but on the other hand in Mists if you have a suboptimal piece you won’t be able to replace it with a better VP set, you’re stuck upgrading your existing item or waiting for a raid drop. At the moment we know about three 5-man dungeons. Scholomance appears to have been given a revamp to bring it up to end-game level and streamline it a bit. Presumably like Deadmines and Shadowfang Keep it will have a low-level normal mode and a high level heroic mode, but it’s not clear. There’s also the Stormstout Brewery and the Temple of the Jade Serpent. For details on those, WoW Insider has a good preview. Something that was promised to us a while ago is the Challenge Modes, which aim to give experienced players a reason to get back into the 5-man instances and challenge themselves, similarly to the way ZA bear runs were aimed. You are also ranked against your server and your guild, so you can get some friendly competition going (although Wowhead News says this only opens up once you’ve completed all the gold medals). Bronze – Is worth an achievement. Most decent groups with a bit of coordination and practice should be able to reach this level. Silver – Gets you transmoggable vanity items with no stats but with a vanity set bonus to encourage you to complete the set. This is new gear, not old sets, and you don’t (as far as I can tell) get a free choice. The fact that it’s stat-free stops this system feeling mandatory, something you have to do to get raiding gear. Gold – Gives you access to a nifty mount. I quite like the idea of challenge modes and I’ll definitely be taking part in them and trying to grab a good haul of gold medals. The only thing that bothers me a bit about them is that the challenge is all about speed, rather than some other measure of skill. In theory speed is a measure of the whole group’s skill: you need a strong tank to chain-pull, an efficient healer to limit deaths and drinking time, and obviously good DPS to kill the packs quickly; in practice I find that the pressure tends to fall more heavily on the tank to keep the pace high. And if someone disconnects, there goes your gold medal. I’d have preferred to see some sort of measure based on execution rather than pure speed, like the way some of the dungeon achievements work at the moment. Perhaps a combination score based on interrupts, damage taken (avoiding the bad), as well as the speed of the kill and probably other factors as well. Then again, if you’re pushing for Challenge Modes then I guess it’s assumed you already know those things and don’t need the extra training. Something I’d not really heard much about before is the Scenario system. These sound like expanded versions of events like the Flamegate area in Hyjal where you get to defeat Ragnaros while questing, the Wrathgate event or the Crucible of Carnage, but with a stronger group focus and with the tasty carrot of Valor Points. They’re also level 90 only, and not quest based. Given that they reward Valor Points, will they become effectively lightweight instances with a different focus or will they be limited to once-through special events? Players are tasked to help a Brewmaster find a spice that’s only useful when it rains. At first, players save some villages and buildings. You then help the Brewmaster create the lager as it’s raining, while she’s besieged by Sauroc. In the final phase, you defend the brewery while putting out fires – a giant Sauroc with a huge sword is trying to destroy the building. Unlike old-style group quests where you had to ask the zone for help; this time there’s a Scenario Finder tool to help you automatically get a group together for a Scenario. The group you make does not depend on having a tank and healer so you can tackle them with whatever players are queueing for the Scenario at that time. I wonder how flexible the group size is, because the numbers of people can vary massively at different times. It’s also not clear if this system is cross-realm, but since it uses instancing there’s no reason why it couldn’t be. If they can be differentiated sufficiently from dungeons I think this is quite a neat approach to group questing, although I think that not scattering them throughout the levelling process misses an opportunity to get some handy practice at group interaction before the level cap. I’m quite a fan of professions, and I’m always interested in seeing what we’re getting in the future. Unfortunately the main professions weren’t really covered at this recent event, although there were some interesting teasers for the secondary professions. Archaeology is getting new items, but it is also getting a faction associated with it, the Lorewalkers. When you turn in Pandaren artefacts you get snippets of lore and cut-scenes. The point, apparently, is to provide a stronger grounding for the profession within the game. Personally I’d also like to see the items either be upgradeable (maybe even through archaeology itself) or new items added as tiers are added to the game. In Cataclysm the equippable items stopped at level 359. For the chefs, there are four specialisations to work on, and you’re able to work on all of them eventually. Each specialisation is related to a primary stat and presumably opens up recipes that grant that stat. Priests would probably go down the Intellect or Spirit route, depending on what’s available. On the quality of life front, we’re apparently getting AoE looting. This is something that we’ve been waiting patiently for for quite some time. Apparently Star Wars included it, and magically it turns up in Mists. Still, I shouldn’t complain, it’s a handy feature whatever prompted its inclusion. There will not be any revisiting of item levels in 5.x. In the past the developers talked about a possible “item squish” because numbers were beginning to grow a little too big to be easily handled: six-figure damage numbers popping up, four-figure stat values on gear and so on. Instead, they’re going with compressing numbers of five or more figures using “k” or “M”. For example, a 120 000 healing crit would display as 120k instead. Similarly a boss might have 435M health. Something that has a lot of people relieved is the addition of an extra character slot. For some it still won’t be enough, but for the rest of us the eleventh slot is a nice gesture, letting us have a new Pandaren or a new Monk without having to select an existing character to let go. Obviously at this point it’s impossible to call the expansion a hit or a miss. I’ve skipped over quite a few of the more well-known new features because they don’t interest me much; but just like I don’t feel threatened by the game’s inclusion of Arena, I doubt “my WoW” will be ruined by the addition of Pet Battles. I will say that the addition of challenge modes should give me something new to do outside raiding, and multiple raids per tier along with the possible return of world bosses could provide some well-needed variety to the raiding scene. Blizzard also hinted that the beta is pretty close, so hopefully I’ll be able to get stuck in very soon and help them make the game as polished as we expect, and of course to report back on how I feel the features are working. In a previous post I talked about the talents Priests will get to choose from in Mists of Pandaria. Under the new system most of the old spec-specific talents will be granted to players as they level up along with general class skills, instead of needing the investment of talent points. 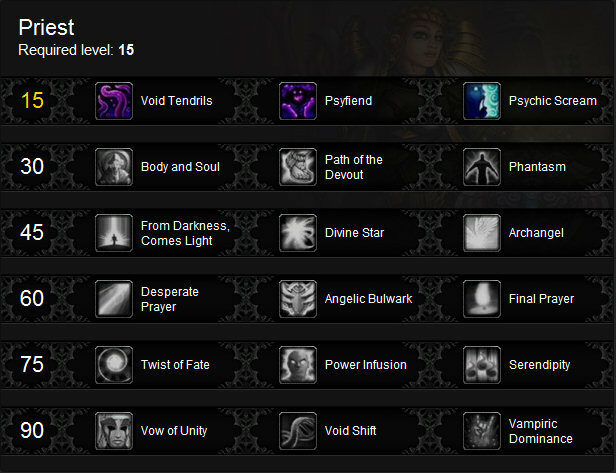 Yesterday Blizzard released a very early pre-alpha version of their Talent Calculator, which included lists of the spells we will acquire and the levels at which we will acquire them. Looking at the spells and trees as posted there are some striking gaps and omissions, and some of the talent and spell descriptions don’t line up with each other. Remember that this is pre-beta information and will undoubtedly change before release. The sky is not falling! If it still looks like this a week before release, then we’ll panic. This post, like the previous one, is simply to see what the announcements thus far suggests about the intentions of the developers and to look at how the new system may work. Credit goes to Harpy’s Nest for getting a list up in a really handy format along with some insightful analysis, and I’d strongly recommend you head over there and check out her post then come back. I’m going to lay out the spell lists out separately, so it’s worth keeping both views in mind. Another take comes from the legendary Derevka, who adds some very healthy ladlefuls of caution to his analysis. Caveat: There are some big omissions in these tables, spells which seem to have vanished altogether, such as Mind Blast and Prayer of Healing. There’s also spells that don’t make sense, or which appear otherwise odd. Bashiok has already said Prayer of Healing’s absence is an oversight and that it won’t be the only quirk in these very early talent/spell lists, which makes it impossible to draw firm conclusions like “Spell X: Gone!”. Where we can draw slightly more reasonable inferences is when spells have been deliberately placed in one or another spec list, although of course even that may change dramatically. The calculator contains elements that are experimental, still in the process of implementation, or in some cases outright failed experiments that we already intend to revise or replace. Odds are good that if it looks like we’ve forgotten some critical piece of a particular class toolkit, it’s either accounted for elsewhere, or simply a data glitch (e.g., Prayer of Healing is currently absent from the calculator – we are not taking Prayer of Healing away from priests, and Devastate for warriors probably won’t sunder armor 453%). Our hope is that revealing the calculator in this state will shed light on the philosophy behind our talent overhaul, and let you get a sense of how pieces of your core rotational gameplay, such as Hot Streak, Riptide, or Sudden Doom, fit into the new system. This is the set of spells that all Priests get as their baseline toolkit, which gets supplemented by their spec-specific spells. 3 Shadow Word: Pain A word of darkness that causes 1398 Shadow damage over 18 sec. 5 Power Word: Shield Draws on the soul of the friendly target to shield them, absorbing 9123 damage. Lasts 15s. While the shield holds, spellcasting will not be interrupted by damage. Once shielded, the target cannot be shielded again for 15 sec. 7 Flash Heal Heals a friendly target for 7603. 9 Inner Fire A burst of Holy energy fills the caster, increasing the armor value from items by 60% and spell power by 2052. 18 Resurrection Brings a dead ally back to life with 35% health and mana. Cannot be cast when in combat. 22 Power Word: Fortitude Power infuses all party and raid members, increasing their stamina by 2257 for 1 hour. If the target is in your party or raid, all party and raid members will be affected. 26 Dispel Magic Dispels magic on the target, removing 2 harmful spells from yourself or 1 beneficial spell from an enemy. 32 Shadow Word: Death A word of dark binding that inflicts 408 Shadow damage to the target. Deals three times as much damage to targets below 25% health. If the target is not killed by Shadow Word: Death, the caster takes damage equal to the damage inflicted upon the target. 34 Levitate Allows the friendly party or raid member to levitate, floating a few feet above the ground. While levitating, the target will fall at a reduced speed and travel over water. Any damage will cancel the effect. Lasts until cancelled. 38 Mind Control Controls a humanoid mind up to level 93, but increases the time between its attacks by 25%. Lasts up to 30 sec. 42 Mind Vision Allows the caster to see through the target’s eyes for 1 min. Will not work if the target is in another instance or on another continent. 64 Shadowfiend Creates a shadowy fiend to attack the target. Caster receives 3% mana when the Shadowfiend attacks. Damage taken by area of effect attacks is reduced. Lasts 15 sec. 76 Mind Sear Causes an explosion of shadow magic around the target, causing 268 Shadow damage every 1 sec for 5 sec to all enemies within 10 yards around the target. 80 Inner Will A burst of Holy energy fills the caster, reducing the mana cost of instant cast spells by 15% and increasing your movement speed by 10%. You can only have Inner Will or Inner Fire active at a time. 84 Leap of Faith You pull the spirit of the friendly party or raid target to you, instantly moving them directly in front of you. What we see in this table is a list of basics (e.g. Flash Heal, Inner Fire/Will, Power Word: Shield, Smite, Shadow Word: Pain) and utility spells (e.g. Resurrection, Power Word: Fortitude, Levitate). The spec-specific lists are where the differentiation is to be expected. As noted in the caveat above, Mind Blast and Mind Spike are gone entirely. I don’t expect them to have really been removed, but neither is it clear at this stage where they’ll end up. I’m hoping they’ll be shunted out to the Shadow list, leaving healing specs with fewer less-relevant abilities to worry about. Notably though all Priests keep Mind Sear and SW:P, which is good because they have specific uses. The new skill and talent system allows the developers to separate out spells far more precisely than before and declutter our spellbooks, and it’s good to see them using that. Our Shadowy brethren will be pleased that they aren’t going to be troubled by all those pesky healing spells in their spellbook and on their bars in the future, since all but the essentials have been shifted out to the spec lists. 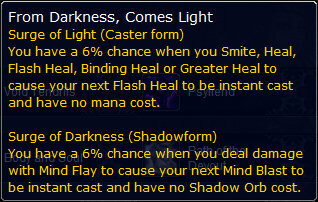 Shadow healing is left with PW:S and Flash Heal, while the slower heals are reserved for the healing specs now. Another notable absentee is Shadow Protection. At this stage it’s a bit early to conclude that it’s been consigned to the bin, but I can’t say I’ll miss it if it is going. 10 Penance Launches a volley of holy light at the target, causing 874 Holy damage to an enemy or 3370 healing to an ally instantly and every 1 sec for 2 sec. 18 Holy Fire Consumes the enemy in Holy flames that cayse 1251 Holy damage and an additional 420 Holy damage over 7 sec. 32 Rapture (Passive) When your Power Word: Shield is completely absorbed or dispelled you are instantly energised with 7% of your total mana. This effect can only occur once every 12 sec. 34 Greater Heal A slow casting spell that heals a single target for 10136. 36 Inner Focus Reduces the mana cost of your next Flash Heal, Greater Heal or Prayer of Healing by 100% and increases its critical effect chance by 25%. 44 Evangelism (Passive) When you cast Smite, Holy Fire or Mind Flay you gain Evangelism. Stacks up to 5 times. Lasts for 20 sec. Increases the damage done by your Smite, Holy Fire and Penance spells by 4% and reduces the mana cost of those spells by 6%. Increases the damage done by your Periodic Shadow spells by 2%. 45 Grace (Passive) Your Flash Heal, Greater Heal, Spirit Shell and Penance spells bless the target with Grace, increasing all healing received from the Priest by 10%. This effect will stack up to 3 times. Effect lasts X. 58 Pain Suppression Instantly reduces a friendly target’s threat by 5%, and reduces all damage they take by 40% for 8 sec. 66 Hymn of Hope Restores 2% mana to 3 nearby low mana friendly party or raid targets every 2 sec for 8 sec, and increases their total maximum mana by 15% for 8 sec. Maximum of 12 mana restores. The Priest must channel to maintain the spell. 68 Prayer of Mending Places a spell on the target that heals them for 3332 the next time they take damage. When the heal occurs, Prayer of Mending jumps to a party or raid member within 20 yards. Jumps up to 5 times and lasts 30 sec after each jump. This spell can only be placed on one target at a time. 70 Power Word: Barrier Summons a holy barrier on the target location that reduces all damage done to friendly targets by 25%. While within the barrier, spellcasting will not be interrupted by damage. The barrier lasts for 10 sec. 78 Train of Thought When you heal with Greater Heal, the cooldown of your Inner Focus is reduced by X sec. When you Smite, the cooldown of your Penance is reduced by Y sec. 80 Mastery: Shield Discipline (Passive) Increases the potency of all your damage absorption spells by 20%. Each point of Mastery increases the potency of absorbs by an additional 2.5%. The healing spells have been split between Holy and Discipline in an interesting fashion: Discipline got to share Greater Heal while Holy wrested Binding Heal, Heal, Renew and Divine Hymn entirely from our fingertips. If this is how it ends up then I’ll be a little sad to lose so much of the flexibility that I’ve enjoyed as a result of playing a Priest; Discipline will be left with Flash Heal, Greater Heal and Penance for tanks and (possibly) Prayer of Healing for the raid, which really does push us squarely down the tank-healing road. One could speculate that this is intentional, to split the Priest specs more definitively into tank- and raid-healing specs, but this doesn’t feel like the best way of achieving that goal. Then again, in 4.2 I don’t often find myself using anything on the list besides Binding Heal, I just like being able to when the situation demands it. As I’ve said, this is early days, so I’m hardly freaking out! Another one to add to the list of notable omissions is Divine Aegis. I’d be very surprised if this didn’t make a reappearance, since it’s so central to how Discipline healing currently works. I my previous post I speculated about who might be able to take advantage of the Archangel talent, and looking at these spell lists, Discipline is the only spec given an Evangelism spell. However, Shadow currently has no Dark Evangelism spell while the talent specifically refers to a dark version, so either the talent or the spells will have to be changed. 10 Holy Word: Chastise Chastise the target for 727 Holy damage, and disorients them for 3 sec. 26 Renew Heals the target for 1373 every 3 sec for 12 sec. 28 Heal Heal your target for 3801. 30 Spirit of Redemption (Passive) Upon death, the priest becomes the Spirit of Redemption for 15s. The Spirit of Redemption cannot move, attack, be attacked or targeted by any spells or effects. While in this form the priest can cast any healing spell free of cost. When the effect ends, the priest dies. 32 Holy Concentration (Passive) Increases the amount of mana regeneration from Spirit while in combat by an additional 30%. 36 Lightwell Creates a Holy Lightwell. Friendly players can click the lightwell to restore 11133 health over 6 sec. Attacks done to you equal to 30% of your total health will cancel the effect. Lightwell lasts for 3 min or 10 charges. 48 Binding Heal Heals a friendly target and the caster for 6085. Low threat. 50 Circle of Healing Heals up to 5 friendly party or raid members within X yards of the target for 2725. Prioritizes healing the most injured party members. Heal, Binding Heal, Prayer of Healing, Prayer of Mending, Mind Spike or Smite will put you into a Chakra state. Increases the critical effect chance of your direct healing spells by 10%, and causes your direct heals to refresh the duration of your Renew on the target. Increases the healing done by your area of effect spells and Renew by 15% and reduces the cooldown of your Circle of Healing by 2 sec. Increases your total damage done by Shadow and Holy spells by 15%. 70 Guardian Spirit Calls upon a guardian spirit to watch over the friendly target. The spirit increases the healing received by the target by 60%, and also prevents the target from dying by sacrificing itself. This sacrifice terminates the effect, but heals the target of 50% of their maximum health. Lasts 10 sec. different ability depending on which state you are in. Instantly heals the target for 6322, and increases the critical effect chance of your healing spells on the target by 25% for 6 sec. 15 sec cooldown. Blesses the ground with Divine light, healing all withinit for 367 every 2 sec for 18 sec. Only one Sanctuary can be active at any one time. 40 sec cooldown. 78 Divine Hymn Heals 5 nearby lowest health friendly party or raid targets within 40 yards for 4496 every 2 sec for 8 sec, and increases healing done to them by 10% for 8 sec. Maximum of 20 heals. The Priest must channel to maintain the spell. 80 Mastery: Echo of Light (Passive) Your direct healing spells heal for an additional 10% over 6 sec. Each point of Mastery provides an additional 1.25% healing over 6 sec. As noted in the Discipline section, Holy seems to have come away with the lion’s share of the juicy healing spells, at least at this stage. I’m not so concerned about Divine Hymn being Holy-only, since it slots in as the rough counterpart to Power Word: Barrier while Guardian Spirit counters Pain Suppression. Honestly, I suspect this separation is just an artefact of the state of the spell lists when the snapshot was taken to create the talent calculator. It would be odd for Blizzard to implement a 3 Heals system in Catalcysm, praise its success, then ignore it again one expansion later. There are a few overlapping spells too, listed here for completeness. Well, as I’ve said throughout, there’s not much to conclude at such an early stage. There are some general observations though. I find it reassuring to see that the old familiar talent abilities haven’t all been lost, and those that are missing may well turn up again in due course. This suggests that healing won’t be changing too dramatically into MoP, which is good given that it’s had one shake-up recently. There is a note of concern that so many of the core Priest healing spells we all know and love seem to have been given to Holy only. This might just be because of the time the snapshot was taken, it might be an oversight, it might be a deliberate design decision to nudge the classes in distinct directions. I hope they don’t go quite as far as these lists suggest, because I think that could lead to a loss of flexibility. I can understand the argument that it would simplify the class for players if you simply didn’t get given Renew, for example, if you’re in the “wrong” spec for it; I’ve heard it said that possibly Priests have ended up with too many options. But a lot of the appeal of the Priest over other healing classes, for me, is having that expanded toolkit, so I’m hoping the separation isn’t permanent. Of course, none of this may mean anything by the time the next iteration comes around, the only real way to know how MoP will play is to get in there in the beta and try it out, which I will of course be doing as soon as it’s available! Ok, before I get into the talent system and the ideas that have been floated for the Priest class in MoP, I should put on the record my views about the Pandaren. Here it comes: I’m really not bothered either way. I also have my doubts that something as small as a new race will truly ruin the game for many people all by itself. After all, we have hooved and tentacled Draenei, giant walking cows, the extremely silly Tuskarr and, the one that would have ruined the game for me if anything was going to: the Worgen. Seriously, there must be someone at Blizzard with a real English accent that they could have been used, surely? Or give me a call, I’ll voice some lines for you. Anyway, that was a year ago, time I was getting over it. The point is, WoW is a tongue-in-cheek game, and will continue to be in the future; if you really want proper high fantasy, this probably isn’t the franchise for you. The way I look at it is to ask myself how often I actually look at the races in the game? When I go to create a new character, or when I interact with a key NPC like the Druid trainer in Stormwind. Otherwise, I just don’t notice people’s races except in passing. It took me a fortnight to realise our new rogue was a Worgen, and even then it was only because I caught him in close-up and thought he was moving oddly. I might play one to see how they look and feel, I might even look on in snobby amusement at the 4 flavour-of-the-month Pandaren in Maraudon with me as I level yet another Priest, and I’ll certainly be on the lookout for the slew of panda-based puns that will inevitably follow, but that’s as far as Pandaren will really affect my experience. Right, off the soapbox again! Here’s the short version of the new talent system, just in case there’s someone out there who hasn’t heard yet: each class still has three specialisations (except Druids who get an extra new one to allow bears and cats to have their own specialisation), but instead of having talent trees tied to each specialisation there’s now a single “tree” per class. Every 15 levels you have to choose between three talents which are broadly similar in goal but different in their details. All those spec-specific spells and boosts that you used to have to talent into are now going to be granted automatically as you level. The developers have always said that they wanted talents to be used to differentiate your character and to specialise. The trouble is that you can’t give players a new spell every level, so most of the talent points end up being spent on things that reduce the cooldown on spell X or increase the damage of spell Y. Some of those talents were stripped away with Cataclysm when the number of talent points was dropped from (potentially) 76 to 41, but the developers clearly didn’t feel that had had enough of an effect for their taste. My experience in Cataclysm has more or less borne that out. There is arguably more choice than there used to be, but cookie-cutter specs, theory-crafted decisions and “filler talents” still predominate. At the most you get a handful of talents to play with, the rest are “mandatory”, so the new system simply grants you all those “mandatory” talents as you level (with no need to visit the trainer), and lets you pick the utility talents directly. The developers have stated that they want talents and talent choices to be switched with a similar level of difficulty as glyphs, which to me seems like a good thing. I like the flexibilty of glyphs in their current form (although I find the range of choices still far too limited) because it gives you the option to switch a few glyphs in and out between pulls to tweak your character for the needs of the encounter you’re facing. If talents go down the same road, that would be a fantastic source of optimisation and a great way of customising your character to your playstyle and the needs of your raid group. Wowhead, on top of this sort of thing as usual, has a Mists of Pandaria Talent Calculator up on their site so you can check out the current iteration of the talents for you classes of choice. I’m going to go through the Priest talents, to see what sort of choices we’re likely to be making in the next expansion. Here you have the choice between a small-radius mass root on a moderate cooldown (which I will not be able to say in my Kiwi guild without hilarity ensuing! ), a multi-target long-range fear with a long cooldown, and the Psychic Scream we all know and love. This is an interesting choice where different situations will favour different talent choices. Psyfiend feels a little bit more like a soloing/PvP talent than a raiding one, although maybe I’m not seeing the niche. The choice between an AoE fear and AoE root is more interesting though. Using existing content for example, rooting Sons of Flame would be more use than fearing them so you can control their direction, whereas in encounters with dangerous melee adds such as the Blood Beasts back in ICC a “proper” CC like a fear would be more useful than a root. Assuming that those two abilities applied to those creature types, of course. The choice at level 30 is all about movement – yours and the raid’s. You’re choosing from the current Body and Soul, a self-applied 25% movement increase while levitating, and a get-out-of-roots Escape Artist-alike. Again, you have a choice depending on your situation. 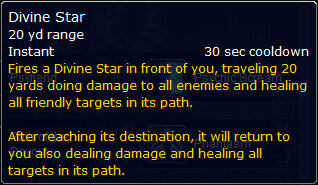 If you’re taking damage so that Levitate just won’t stay up, then Path of the Devout probably won’t be of much use. But for getting around dungeons or running around during an encounter it could be brilliant, especially since Levitate is instant-cast. I can see that being very handy for a number of mechanics, like getting behind Meteors on Alysrazor or getting away from Sindragosa before the Blistering Cold gets you. If you don’t personally need the speed boost, you might instead pick Body and Soul to help your team-mates with kiting or getting out of the bad quicker. I love that Body and Soul has been opened up to all specs now, because it’s a fantastic utility spell that I’ve definitely missed since switching to Discipline. Phantasm may take more care to find uses for it, especially since many boss root effects aren’t removable, but there are effects like heroic Beth’tilac’s Volatile Poison which this would be very handy for. At level 45 the choice is a bit more diverse. The three talents broadly give you some way to boost your output or your efficiency, depending on your taste. From Darkness, Comes Light (complete with bonus comma) in its healing form is the good old Surge of Light talent. You get a low but non-zero change to proc a free, instant Flash Heal. This can be a nice way of throwing a quick decent-sized heal on someone for no cost, or a simple efficiency boost. The most interesting is Divine Star, which travels 20 yards in front of you, healing (and damaging) anything in its path, before turning around and doing the same on the way back. Sort of Light of Dawn meets Flame Orb. This could be very handy when the raid can be grouped up, but probably not so valuable on spread-out encounters, depending on the range. Finally we have Archangel. If Archangel is going to be a viable choice for all three specs then it has to be something which is going to be granted to all three Priest specs as part of our standard toolkit, which is cool in itself. 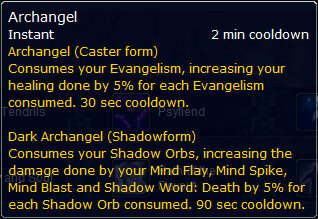 So assuming you have the opportunity to stack Evangelism, the Archangel talent gives you a pretty significant healing boost every 30 seconds, which would be great for encounters with alternating heavy and light damage phases. At level 60, you get a selection of talents designed to keep you alive. You have Desperate Prayer for a quick 30% heal every 2 minutes, Angelic Bulwark for a permanent 30% buff to your shield effects on yourself, and Final Prayer for a stay of execution when your health drops very low. Probably the easiest to understand is Desperate Prayer, although with such a long cooldown its utility might be limited. Angelic Bulwark is a nice talent if you’re taking a lot of damage and are going to get the value from the larger shields. AoE-heavy fights might be one good example, or a fight where you’re soaking a debuff or DoT. It also sounds like a good pick for soloing and PvP where personal protection is high on the agenda and shields are used frequently. Final Prayer is a complex talent. Essentially, it grants you a chance to live where you might otherwise have died, and it’s passive, although it has an internal cooldown of 90 seconds. Where might this be useful? Back to Majordomo, you get Leaping Flames on you. If you’re a little slow to react and get out, Final Prayer pops up and gives you an extra 20% of your HP as an absorb bubble, soaking up an extra tick that might otherwise have left you perilously low or even dead. All while you’re running out. You could achieve the same with a self-bubble or Pain Suppression, of course, so you’ll need to weight up the advantages to you of the passive nature of Final Prayer versus the other talents available. Another eclectic mix at level 75: a buff to damage and healing to targets below 25% HP, our old friend Power Infusion, and the haste boost of Serendipity. You can rule Twist of Fate in or out depending on the fight mechanics and damage profile, because it will either be near-useless or godlike depending on where those green bars spend their time, but the choice between Power Infusion and Serendipity is going to be tough. As they stand at the moment, if you need a throughput boost and your mana will take the strain then Serendipity looks like the better pick. On the other hand, Power Infusion is a strong personal cooldown for efficiency as well as throughput, and also has application to the rest of the raid as well. So when DPS checks are your biggest problem you might want to plump for PI to help out your friendly neighbourhood damage-dealer and pay them back for all the Focus Magics over the months. Here’s where things really get interesting. Two life-saving single-target cooldowns or AoE-Atonement-Lite. First up is Vow of Unity. This one looks a lot like Hand of Sacrifice. Throw it on your tank, for example, and half the damage she takes is instead applied to you; to stop this from killing you, you also heal yourself for 20% of the healing you do to the target, and the rate of damage transferred to you is capped because if the target takes a larger hit than 30% of the target’s HP the effect is broken. What’s not clear to me is whether the hit is transferred anyway and then the transfer ends, or if too large a hit simply doesn’t transfer. The other option you have for saving someone’s bacon is Void Shift, where you swap HP with a friendly player. Again, it’s not clear is if this is temporary or permanent. If it’s temporary, then if, say, your tank is near-death and you can’t get heals in quickly enough, you can loan her your health bar for a while, buying time for the other healers to switch in or for the enrage or whatever caused the problem to dissipate. You will still need to heal the damage up before the bars swap back though, so that’s something that might catch people out. If it’s permanent, you just give your tank whatever health you had last, while you inherit their near-empty health bar, although you get a quick free heal for yourself to keep you out of the danger zone. I rather hope the second case is what we’ll get, but at this point it’s not clear. The confusion comes from the words “when the effect ends”. Picking between the two is going to end up being one part personal preference to one part damage profile. 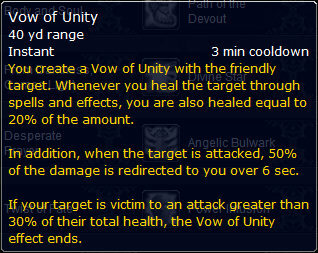 Vow of Unity seems like it’s positioned as a more conventional tank cooldown for when a tank (or other player) is going to take a lot of damage, probably over a sustained period like when picking up a few extra adds or when a boss gains a temporary enrage. Void Shift will probably be more useful after a single larger hit or when a healer is taken out of commission, because it’s more of a quick “buying time” ability than a proper damage-reduction ability. That 30% figure is one to bear in mind though, to make sure you’re not losing the benefit earlier than necessary. Finally, we have Vampiric Dominance, which lets 15% of your damage and healing “splash” to up to three nearby targets, chosen smartly. Those who remember the old Paladin Glyph of Holy Light will find this talent familiar. A great talent when there’s players grouped up, how useful it is when we’re spread out will depend on the radius, really. Which way you go at level 90 is a choice between AoE-heavy and tank-heavy fights. Looking at the abilities in the tree, it’s clear that the developers have tried to play up the “choice” angle and play down the “buff” angle. Although you have abilities that will buff you, they’re interesting mechanics, procs and abilities rather than stat boosts. At each tier you have options that may be more or less useful depending on your playstyle and the demands of the encounter, such as the choice between Body and Soul that can be used on anyone or a get-out-of-roots-free-card for yourself, or between a mass root or mass fear. As a player I can see this giving me stronger customisation and greater choice, and another avenue for me to adapt myself to be the best I can be. These choices aren’t always clear-cut and they are meaningful; there’s no change-the-colour-of-my-spells style talents here. There are a few which I can see being tweaked and improved as development continues, but if the talents went live now I think we would get along with them just fine. Taking a different perspective, as someone who ends up reading a few healer applications I can see the interview process being a lot more interesting, as people get to really explore their choice of talents and preferences rather than “EJ told me to spec this way”. For a guild raiding heroic modes, I think that with fewer options and easier talent changes we’re going to expect people to really be in command of all of their talents and know when each talent will be best used, and that’s a good thing. Depth is always preferable to breadth, in my opinion.